Commitment to the wellbeing of children worldwide. Mustafa Abdalla M Salih; Satti Abdelrahim Satti. Another horizon and breakthrough for the Sudanese Journal of Paediatrics. Sudanese journal of paediatrics 2016; 16(1): 6-8. Outstanding contribution of British medicine to child health in Sudan. 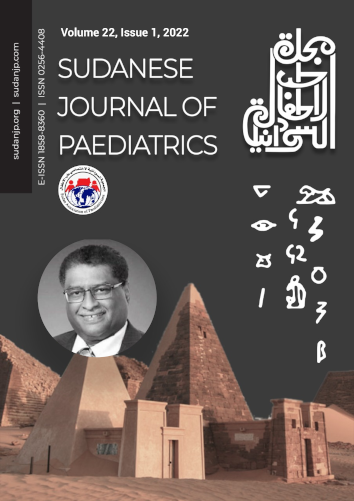 Sudanese journal of paediatrics 2016; 16(2): 6-12. Building Gaafar Ibnauf Childrens Hospital: Unprecedented story. Sudanese journal of paediatrics 2015; 15(2): 100-8. Salih MAM, Satti SA. Commitment to the wellbeing of children worldwide.. Sudan J Paed. 2011; 11(2): 4-5. Salih MAM, Satti SA. Commitment to the wellbeing of children worldwide.. http://www.sudanjp.com/?mno=280783 [Access: April 22, 2019]. Salih MAM, Satti SA. Commitment to the wellbeing of children worldwide.. Sudan J Paed. (2011), [cited April 22, 2019]; 11(2): 4-5. Salih, M. A. M. & Satti, . S. A. (2011) Commitment to the wellbeing of children worldwide.. Sudan J Paed, 11 (2), 4-5. Salih, Mustafa Abdalla M, and Satti Abdelrahim Satti. 2011. Commitment to the wellbeing of children worldwide.. Sudanese Journal of Paediatrics, 11 (2), 4-5. Salih, Mustafa Abdalla M, and Satti Abdelrahim Satti. "Commitment to the wellbeing of children worldwide.." Sudanese Journal of Paediatrics 11 (2011), 4-5. Salih, Mustafa Abdalla M, and Satti Abdelrahim Satti. "Commitment to the wellbeing of children worldwide.." Sudanese Journal of Paediatrics 11.2 (2011), 4-5. Print. Salih, M. A. M. & Satti, . S. A. (2011) Commitment to the wellbeing of children worldwide.. Sudanese Journal of Paediatrics, 11 (2), 4-5. Sudan J Paed. Year: 2011, Volume: 11, Issue: 2: 4-5.